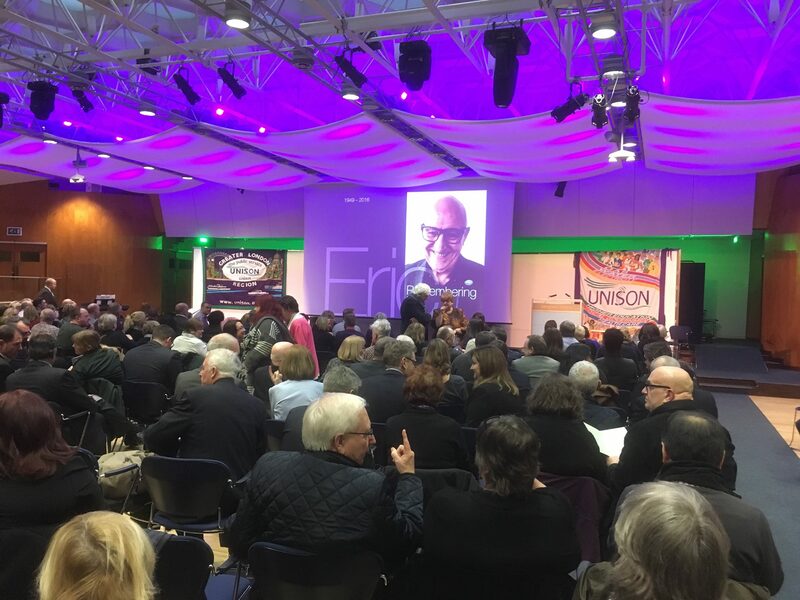 In the days after Eric’s death UNISON set up a Remembering Eric Roberts web page where people could leave their tributes. 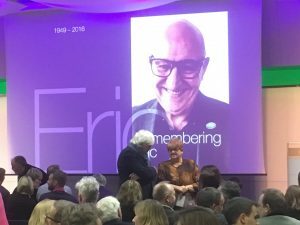 The UNISON team did a great job of curating that page and there are some very special messages there from people whose lives Eric affected in all sorts of ways. It is very nice to see messages from MPs and from London’s mayor, Sadiq Khan and I know Eric would have appreciated those very much. But I also know that he would have been proudest of the messages from close colleagues like Gail Adams, Andrea Gibbs and Liz Thompson – to name just some of the special people he worked with over the years. And messages like that from Linda Hobson of the Newcastle Hospitals Branch would have moved him too. She describes how Leanne, a young member of her branch, was inspired to get over her nerves about speaking at Conference when she saw Eric chairing a session and said ‘”what a lovely and kind man he seemed and that if he could get up there and do that she could deliver her speech” – which she did, brilliantly’. Eric received a tweet about this in the days after Conference, and it was one of the things he most wanted to tell me about the next time we saw each other. 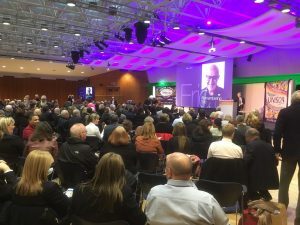 This is the sort of thing that made him proudest: knowing that he had inspired a young member with confidence to speak in front of a conference that he had also found daunting in the (not-so-distant) past. Eric wasn’t actually very self-confident. I believe that in the last couple of years he was finally beginning to see how much other people admired and respected him outside of his immediate family. He already knew how his real family – Jane, Jack and Rhian – and his LAS UNISON family and I felt about him: he was always secure in our love and respect. But beyond us, he was taken by surprise each time he was affirmed, for example when he saw the standing ovation when his presidency was announced at Conference. He treasured all of this. Modestly. Several people have said how he never sought office, nor took it because it made him feel important, but only because he thought he could make a difference for other people. If only more people in public life were motivated in the same way! But enough of my own opinions! Below I will post some links to articles and some of the extra messages and tributes that came my way via Facebook and email. If you would like to add something of your own (words, photos, video or audio) please email me at Eggonthemoon@kathyj.com or use the comments box below. Do add a photo of yourself if you would like me to post that next to your contribution. 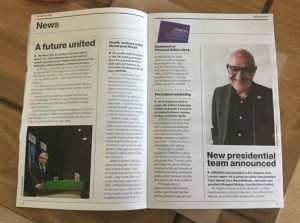 Healthcare Manager, the magazine for MIP and Ambulance Today have both published obituaries. It gave many people the chance to send messages and share their feelings. Thank you to everyone who did that. Here are just a few of the comments. Andy Heward He’ll leave a gaping hole in many people’s hearts and minds. My heartfelt thoughts go out to you and Jack. Peter Thorpe: Very sad to hear this news. Eric has left a tremendous legacy not just at LAS but in Unison. Kathy my thoughts are with you and all of Eric’s friends and family. Marretta Corliss: Kathy, you don’t know me but my nick name is Metsy (or Mitsy) but Eric was an absolute legend ! I worked with him for years at Camden years ago . He was amazing, helped everybody, kind, a real sweetie. Everybody is just stunned. We all had such good times and laughed heartily! RIP lovely Eric. I know there has been much on Facebook and Twitter about the death yesterday of Unison president and London Ambulance Service branch secretary Eric Roberts but I just wanted to pay my personal tribute to a great man. 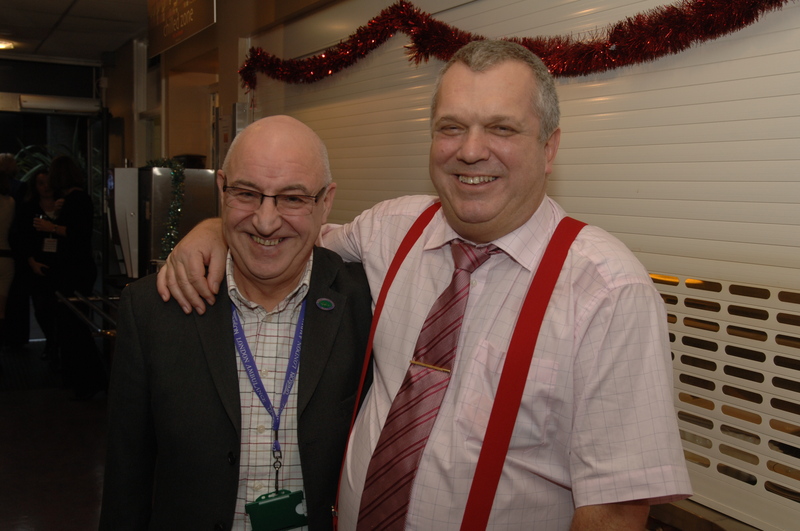 Eric dedicated most of his life to serving his fellow ambulance workers and colleagues in the wider NHS. He fought for better terms and conditions – much deserved for those underpaid ambulance crews who strive, sometimes against the odds to care for, and save the lives of, Londoners. Sometimes Eric could be a hard man – he needed to be – and he made enemies along the way. But he was a caring person with great compassion – that is why he did the job. He was also a loving person with a mischievous, fantastic sense of humour. I send my condolences to Kathy Jones and to all his family. A succinct capturing of Eric’s rock solid proud trade unionism together with a clear passing on of the baton of beautiful humour from father to son. Eric – president of Unison and branch secretary at the London Ambulance Service – died in November. On the day of his funeral in December I posted a tribute to him on Facebook. I will not repeat those words now. However, the personal tributes spoken that day were echoed this afternoon at the celebration of Eric’s life in the TUC HQ and then at Unison’s HQ on the Euston Road. Anecdotes illustrated Eric’s enormous dedication to family and trade union; his care and compassion for his friends, colleagues and patients; his bravery and his gargantuan sense of humour. To Kathy, Jack and other grieving family members and friends, I say this: In those moments of silence and sadness when grief raises its head again and again, do not think for one minute that Eric is being forgotten. There will always be someone speaking of him and there will always be someone benefitting from his good works. 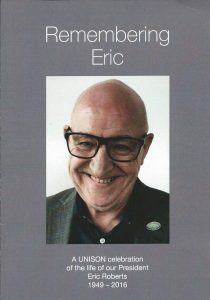 ERIC, for goodness sake don’t rest in peace – wherever you are, shout at the footie results; tell some guffawing jokes; cut some manager down with a dry quip; and see if you can transmit some care and compassion – we need it !